So, it’s 2015 and many of us will have made a New Year’s Resolution to organise our paperwork and get rid of documents, old bills and other correspondence. It’s a task most of us dread let alone the stress and worry of how to securely dispose of this material– However help is at hand at two locations in Waterford and Limerick to mark Data Protection Day on January 28th 2015. 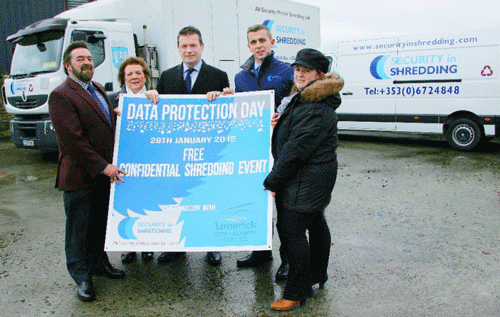 Minister for Environment – Alan Kelly supports Security in Shredding in celebrating Data Protection Day whom are offering A Free…. Yes FREE on-site shredding service for householders and SME’s on January 28th, in conjunction with the Southern Region Waste Management Office, Limerick City and County Council and Waterford City and County Council Authorities. The event will encourage data protection and the best practices in addition to waste segregation and the appropriate, safe and secure methods of disposing paper waste. Householders & small businesses across the region are encouraged to bring along documents to the designated locations and avoid the financial, mental and emotional loss associated with identity theft on Data Protection Day. By participating in this event you would be beginning 2015 with organized and clutter free filing cabinets, office space, creating a clean and positive working environment as well as the piece of mind that your documents are being handled securely minimising the risk of identity theft and data breaches that are caused by documents being exposed.
} In 2013 the Data Protection Commissioner for Ireland received 1,507 data breach notifications – 25 times the number reported in 2009. These events are taking place at the Mungret Recycling Centre Limerick and the Kilbarry Civic Amenity Site, Waterford between 11am and 3.30pm on January 28th. All materials will be shredded on-site, eliminating risks, 100% of shredded material is recycled. Those who avail of the event and wish to put their names into a free draw on the day will be in with a chance of winning a one night stay B&B in the Commons Inn Hotel at the Mungret Recycling Centre draw and a one night stay B&B in the South Court Hotel at the Kilbarry CAS draw. So drop in on the 28th of January and make use of this FREE CONFIDENTIAL SHREDDING EVENT. Two refuse sacks per person. This entry was posted in 28th January 2015, Confidential Shredding, Corporate Social Responsibility, Data Protection and tagged Data Privacy, Data Protection, Data Protection Day, Ireland, Minister Alan Kelly, Minister for Environment, paper Shredding by Security in Shredding. Bookmark the permalink.